Plot: In the year 1191, King Richard the Lionheart (Ian Hunter) left England to reclaim the Holy Land in the crusades, with his bitter brother Prince John (Claude Raines) in charge. When Richard is captured in Austria John – a Norman — seizes the opportunity to increase his power over the Saxons of England, raising taxes and seizing goods and services on the populace… even enslaving people who refuse to toil for his crony, Sir Guy of Gisbourne (Basil Rathbone). The Saxon Sir Robin of Locksley (Errol Flynn) begins to resist the Norman oppression of the Saxons. As John hosts a banquet, Robin himself arrives. Robin makes it clear his intention is to rouse the people of England into revolt against John, then fights his way to freedom in front of Norman noblewoman Maid Marian (Olivia de Havilland). Returning home, Robin and Will Scarlett (Patric Knowles) encounter a large man (Alan Hale) crossing a stream. Robin and the man battle, and Robin is knocked into the water. Laughing at the scuffle, they befriend the man – John Little – and together unite a band of free people of England who swear to fight John and defend all innocent – Norman and Saxon alike — until the return of King Richard. As Guy leads a procession through Sherwood Forest, Robin’s men capture them all, humiliating Guy and the Sheriff of Nottinham (Melville Cooper). Robin attempts to impress Marian with their frivolity, but she remains cold. Her heart begins to change, though, when she realizes Robin and his men intend to return the goods they have stolen to King Richard and he introduces her to some of the Saxons suffering. For the first time, Robin exposes Marian to the misery John’s rule has wrought. The Sheriff proposes a trap for Robin – an archery contest with a golden arrow presented by Marian as a prize. Robin enters in disguise and, after several rounds, wins. As Marian presents him with his prize, Sir Guy exposes him and he is captured. Robin is sentenced to death and imprisoned, and Marian rushes to his men to help plan a rescue. They disrupt his execution and flee. That night, as he comes to thank her, he overhears her professing her love for him, and he shares his own. A bishop brings John the news that King Richard has escaped his captivity and returned to England. John sends an assassin to kill him, but Marian overhears his plan. Before she can send word to Robin, she is discovered by Sir Guy and arrested. Robin and his men capture Richard, not realizing who he is at first, and impress the King with their loyalty. They are together when they learn of Marian’s execution, which is scheduled to coincide with John’s coronation. Robin and Richard lead their men into battle. Robin kills Sir Guy and frees Marian, and the forces loyal to Richard overwhelm those of Prince John. Robin is made Baron of Locksley and given Marian’s hand in marriage. Richard banishes John and his men from England and calls for Normans and Saxons alike to share the freedoms of true Englishmen. Thoughts: For generations this was not only the benchmark of Robin Hood movies, but the archetype against which all swashbucklers would be measured. Errol Flynn is truly magnificent in the title role, cutting a dashing figure of such strength and earnestness that one couldn’t help but want to follow him into battle. This is, I confess, the first time I’ve ever seen this version of Robin Hood, but it’s one of those movies that’s known so well through parody and inspiration that I may as well have. Dozens of cartoons, TV shows and other films have liberally borrowed chunks of this movie wholesale. Flynn’s performance hasn’t informed too many of the modern Robin Hoods, each of whom seems to want to offer a different take on the character, but any other time a film tries to give a taste of Golden Age glory in an adventure tale, Flynn is the inspiration. You can feel pieces of his performance in Cary Elwes’s Westley from The Princess Bride, spoofed in Monty Python and the Holy Grail, and as the hero Timothy Dalton’s villain pretends to be in The Rocketeer. Although Robin is the hero here, and a great one at that, Flynn isn’t afraid to let him feel a little humiliation. His defeat against Little John at the stream is an iconic moment, and one that’s easy for him to laugh off. His first encounter with Eugene Pallette’s Friar Tuck follows a similar pattern, but Tuck fights a bit more ferociously, and Robin comes across as a bit of a bully before he extends his hand in friendship. Olivia de Havilland is radiant as Marian, and does a good job of selling her change of heart. In the early scenes it’s easy to feel discomfort – even disgust – during her dealings with Robin. As she starts to realize the truth about John’s rule, her emotional metamorphosis is slow, but convincing. By the time we reach the scene where Robin is sentenced to death, you can tell she’s in love with the man and trying desperately not to show it in the face of his enemies. The villains are an odd collection. Rains’s Prince John comes across as a bit of a lightweight, but he’s at least sharp enough to have Rathbone’s Guy of Gisbourne as his enforcer. He’s not a physical threat on his own, but you can believe he would command a man of Gisbourne’s menace. The Sheriff, on the other hand, is a real goof. He’s cowardly and ineffective, with only the inspiration for the archery contest keeping him from being entirely useless. A comic relief villain isn’t necessarily a bad thing, but considering how elevated the Sheriff often is in Robin Hood lore, I was a bit surprised to see him as the clown in this early, iconic cinema version of the story. The fight scenes are particularly impressive for the time period. Intricately choreographed, Flynn and his men put up an impressive front against the worst Prince John can send against them. Although there is a good dose of Hollywood magic to it (the swords, for instance, are not particularly convincing as weapons, although they’re handled very well), it’s the sort of thing that you forgive as a staple of the time, even as the presentation is wonderfully entertaining. The archery scene is another one of those moments that has been endlessly parodied and referenced, and it’s done fairly well. In these long-ago days, before CGI and the effort to give us an arrow’s-eye view of the winning shot, it’s presented in a very straightforward, simple style that nonetheless pleases the eye and brings a smile to a real lover of old cinema. The final, climactic battle feels like a template for all great swordfights. Watching dozens of men fight and dozens of swords flash at once is a blast, the sort of thing every kid who’s ever picked up a branch and pretended it’s a blade dreams of. While Robin and Guy are having their own final confrontation, the directors start getting fancy: they walk off-camera and we watch as their shadows carry on the fight. Close-ups of the two of them as they grapple ratchet up the tension until Robin deals the final blow, and Guy’s plunge down the stairwell looks painful enough to be real. One thing that rather surprised me about the film was just how much of it had the overtones of racism. Granted, the Saxons and the Normans are pretty indistinguishable to a viewer, but the oppression of the Saxons cuts a deep swath through the American heart. It’s impossible to hear the disgust John espouses without it evoking the nastier aspects of our own past. In truth, considering that this film takes place in the 12th century, it works well as a reminder that ignorance isn’t exactly a new invention. At the same time, fortunately, it does give us some hope that even 900 years ago, there were men willing to stand against it. This movie is justifiably hailed as one of the all-time great adventure films, and it’s as fine an example of golden age cinema as I can imagine. 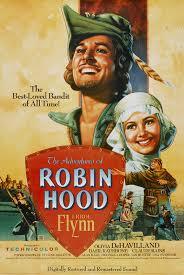 For many, for decades, Errol Flynn was Robin Hood. And in truth, when you watch this movie, he always will be.